On Sunday night, AMC’s Mad Men wrapped up its extraordinary eight-year run. You can read my full review and analysis of the finale here, and now that the series is over, we are spending an entire week bidding farewell to this incredible show by counting down the Top 20 episodes from throughout the run. Things kicked off Monday with #20 - #16, continued Tuesday with #15 - #11, and Wednesday with #10 - #6, and wraps up today with the final five episodes of the countdown. The most structurally adventurous episode Mad Men ever did, “Far Away Places” is a nightmarish triptych of incredible artistic power. With three overlapping stories in which characters are knocked out of balance, “Far Away Places” is a haunting and evocative exploration of the space between the end of a dream and the beginning of reality, and in addition to being one of the show’s most fascinating episodes, it is also, simply put, one of the most immediately involving. Peggy has a bad day, after fighting with boyfriend Abe and trying to imitate Don’s level of assertiveness in a pitch meeting, and winds up wandering through a dark, lonely night. Few pieces of visual art have ever, for me, simulated the feeling of having a rough, off-kilter day as this segment does. While I have never taken LSD, I assume something similar could be said for Roger and Jane’s trip in the second-story, in which the effects of LSD are illustrated not with wild stylistic histrionics, but with little point-of-view flourishes and, again, an infectious sense of imbalance. And the third story, in which Don tries taking Megan on another fun vacation, and instead insults and temporarily loses her by treating her like an object, is like being transported straight into the middle of a waking nightmare. For Don, this hour is the answer to “Tomorrowland,” the moment in which the surface of the fantasy he thought Megan represented disintegrates, and the reality that Megan is a complicated human being whom he cannot assume he fully ‘knows,’ sends him into an existential spiral. Few episodes of Mad Men hurt as hard as this one does when it goes in for the punch, and fewer still are this completely captivating, thought-provoking, and altogether profound. Every time I revisit it, I feel as if I am watching a dream unfold, coming out on the other side as though I have made contact with a miraculously fluid artistic object. What I look for most in art is a meaningful well of feeling; Mad Men offered that in spades on a week-to-week basis, but in few weeks was the well quite so deep as this. 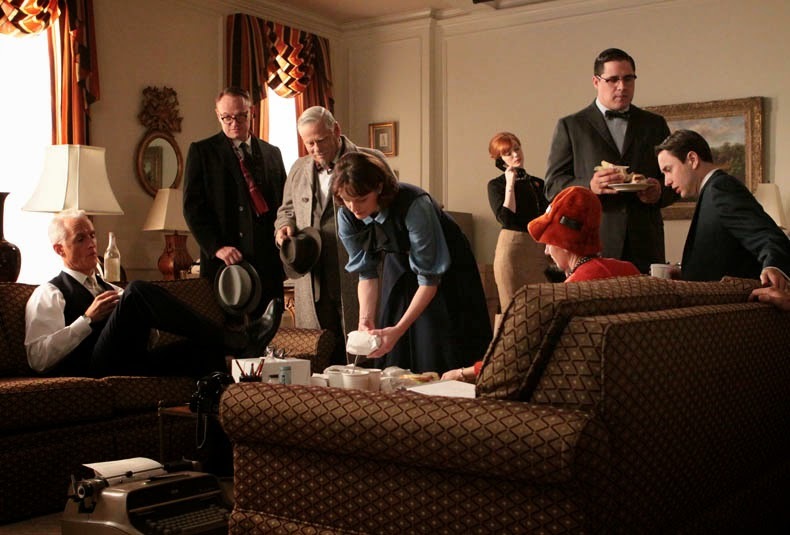 Or The Great ‘Mad Men’ Caper, in which Don and friends band together to start their own agency when PPL decides to sell Sterling Cooper to McCann, and Weiner and company deliver one of the most crackling, fun, and inventive episodes of the entire series. 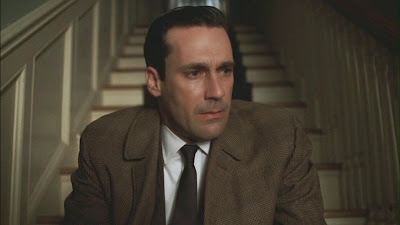 Mad Men would play the ‘agency restructuring caper’ card again, and always to good effect, but never better than in “Shut the Door, Have a Seat.” It isn’t just that the episode is so gripping, so thrillingly paced and filled with terrific, fist-pump moments – Joan walking in near the end as the team’s managerial trump card is always worthy of applause – but because the caper intersects with the ultimate implosion of Don Draper’s home life, and ties together a number of significant character arcs not just from the third season, but from the entirety of the show’s first three years. So we have Betty finally deciding that enough is enough, and demanding a divorce from Don, who when forced to reap what he has sewn responds with one last monstrous action (Don cruelly calling Betty a ‘whore’ is perhaps the hour’s most painful moment). But as Don irreparably breaks his most important relationship forever, he also has to repair several others, coming to a stalemate with Roger (who he had been angry with all season), finally telling Pete that he is indeed good at his job, and most importantly, making it clear to Peggy, after a season of being distant, how much she means to him. “I will spend the rest of my life trying to hire you,” he tells her, at the end of a scene that ranks high amongst the best Jon Hamm/Elisabeth Moss duets. 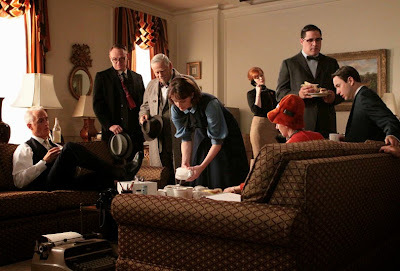 In the end, with Don and most of the rest of the Sterling Cooper principals operating out of a big hotel room, one phase of every character’s life has been left behind, and an uncertain future awaits each of them. It feels very much like the end of an era, the conclusion to one phase of Mad Men and the beginning of another. The show would go on to do at least one episode better than this, and there are two I like even more from earlier, but in many ways, “Shut the Door, Have a Seat” feels like a pretty remarkable creative peak, a summation of everything Mad Men had so far been, and a preview of everything it would continue to be. And some weeks, Weiner and company would just give themselves over to well-orchestrated lunacy, and run a tractor over an unlucky British man’s foot in the middle of the office. While I wouldn’t quite call “Guy Walks Into an Advertising Agency” the ‘best’ episode of Mad Men, it is almost certainly my favorite to watch, because I struggle to think of any single episode of television, in a drama or a comedy, that I find actively funnier than “Guy”. The tractor incident itself is breathlessly hilarious, in part because the groundwork is so expertly laid – there is an active tension to PPL’s office visit, as it intersects with Joan’s departure and everyone losing professional power, and much of the laughter comes from the breaking of that tension – and in part because director Lesli Linka Glatter pushes the macabre as far as it will go. The reactions to it might be even funnier: the squeegee on the office window, Roger’s “Just when he got his foot in the door,” Don and Joan laughing at the hospital (“That’s life. One minute you’re on top of the world, the next minute some secretary’s running you over with a lawn mower.”), etc. But there are so many other good comic moments too, including one of the great unsung Don/Peggy interactions ever. 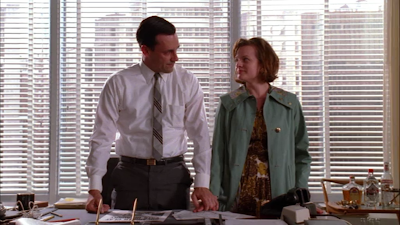 “This is good champagne,” Peggy says while standing next to Don at the office party. “I don’t think so,” Don replies dryly, and walks away. But what pushes “Guy Walks Into an Advertising Agency” all the way over the top for me is that, in addition to being hilarious, it is such a smart and wide-ranging character showcase. This is one of the very best Joan episodes, as she is scheduled to have her last day at the office before Greg will supposedly get a nice, cushy job, and when he unsurprisingly doesn’t, her many layers of emotional confliction are palpable. Lane, in perhaps his first great character showcase, is quietly incensed at being ordered by PPL to relocate again, after having settled in at Sterling Cooper. At the Draper home, Sally struggles with her feelings towards newborn sibling Gene, and Betty tries (mostly unsuccessfully) to comfort her. It is a great little Sally/Betty story, and ends with one of the best Don and Sally scenes in the show’s history (and definitely the best, or perhaps only, Don/Gene scene ever). It even goes to credits with one of my favorite early Dylan songs (“Song to Woody”), just to go further after my own heart. So “Guy Walks Into an Advertising Agency” is the funniest episode Mad Men ever did, makes excellent use of virtually every member of the cast, and even packs a number of strong dramatic punches. It is the complete package, and writing about it just makes me want to go watch and laugh at it all over again. It has become a cliché at this point to call “The Suitcase” the greatest episode of Mad Men, but for good reason: Don and Peggy are the show’s best and most central characters, their relationship is the most important one in the series, and “The Suitcase” is a stunningly written and performed exploration of that relationship. 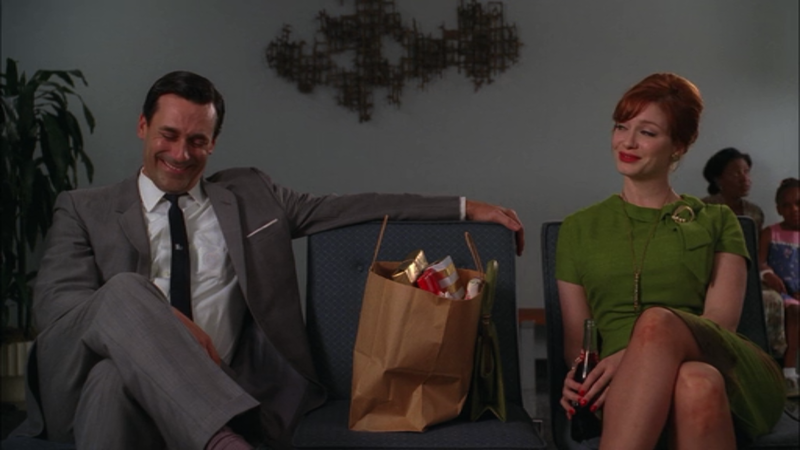 Anyone who wants to claim this is the series’ best single hour will hear no argument from me – I just happen to feel there is one other episode that summarizes the overall impact of Mad Men even more strongly. But “The Suitcase” is undeniably masterful. There are so many brilliant pieces of set-up on display to make is resonate, and part of that is that, at this point in the series, Don and Peggy’s relationship has been pushed to a fairly ugly and toxic place. Over the course of this one hour, it gets torn apart and rebuilt, on a day in which Don is at the nadir of his downward spiral – waiting for the call he knows will tell him Anna Draper is dead – and on a birthday in which Peggy feels largely unloved. Her loser boyfriend has planned a surprise dinner with her family, which creates a whole lot of comedy in the first half of the episode, but also an interesting dilemma for Peggy, who whether she wants to admit it or not would rather be at the office, working with Don, than going out with people who mean so little to her. And that, ultimately, is what “The Suitcase” is all about: the intersection of two people, whose relationship has never been easy, and yet who mean more to one another than either could ever express. It is one of the most profound and intangible ideas an artist could ever choose to explore, and yet in “The Suitcase,” Matthew Weiner and Jennifer Getzinger and Jon Hamm and Elisabeth Moss all collectively tackle it with a breathtaking amount of dramatic insight and emotional depth. For Weiner, this is one of his great feats of writing, a script that is so rich and dense that it takes on a theatrical quality. One could stage and recite “The Suitcase” in a hundred different ways, and I suspect it would always have power. But this is the version which hits hardest, for Getzinger has captured it so well – seamlessly riding the tonal shifts, creating beautiful images within a largely interior episode, etc. – and Hamm and Moss have committed to the material so completely, that the final result is kind of overwhelming. As we watch Don and Peggy at first act contentious towards each other – culminating in the iconic “That’s what the money is for!” – then start to warm up, then share some much-needed laughs – the best being about Roger’s memoir, “Sterling’s Gold” – and finally be there for each other when Don makes the dreaded phone call, both character and audience are put through an intense emotional wringer. And like Don and Peggy, once we come out on the other side, the world somehow seems clearer, like a great and necessary purging of feeling has come and gone. “Open or closed?” Peggy asks Don the following morning, when leaving his office. And as she walks out, no matter how many times I see it – and I have definitely seen “The Suitcase” more than any other episode of Mad Men – the world seems just a little bit brighter. This quote, from Don’s climactic pitch to Kodak, is the greatest single piece of writing across all seven seasons of Mad Men, and among the most powerful and transfixing sequences I have ever seen on screen. It is Don Draper’s greatest pitch, and as he gives it, looking at pictures of his family, a hazy sea of smoke billowing through the room, he sells himself on the happy family life he has spent this entire first season running from – right at the moment when the person he has hurt most in this world, Betty, realizes how thoroughly Don has broken her heart. If “The Wheel” offered only this, it would automatically be a contender for the Top 10. 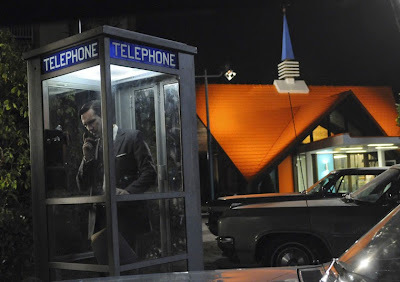 What makes it the greatest single episode of Mad Men is that Don’s pitch is merely the epicenter of an hour in which personal arcs culminate in the most understatedly powerful ways possible, and in which the foundational ideas of this series – of identity, of love, of nostalgia, of the relentless passage of time – are explored with wonderfully fluid dramatic beauty. Peggy’s surprise pregnancy is not my favorite storyline from the run of the series, but it climaxes to great effect here, as her reaction to the baby symbolizes what all the principal characters are going through in this hour. There are these phantoms, from our pasts and present, that we can never escape from, even when they aren’t entirely real. Like Peggy, Don and Betty and the others ignore that phantom that rests inside of them, right up until the moment it consumes their heart. For Betty, that sense of consumption comes when she realizes Don has been cheating on her, not because she accidentally runs into one of his affairs, or finds some damning piece of evidence, but because neighbor Francine has a cheating husband, and when confronted with this idea, Betty realizes the truth has been in her face all along. “The Wheel” contains the best performance January Jones ever gave on this show, in two scenes in particular. In the first, Betty runs into neighbor boy Glen in the parking lot. “I can’t talk to anyone,” she tells him. “It’s so horrible. I’m so sad.” And he gives her his hand, and I start to tear up, and I wonder why anyone could ever possibly be a Betty Draper hater. Because she isn’t a monster – she is a product of a world so rigid and abusive that the only person she can reach out to, on one of the hardest days of her life, is a more-than-possibly disturbed little boy. This kind of hauntingly beautiful writing – and the great performers who deliver it – represents so much of what I love about Mad Men. So does the episode’s quiet, expertly restrained direction, all of it so flawlessly realized that I still find it hard to believe “The Wheel” was Weiner’s directorial debut. There is a calm sense of emotional weight to everything that happens in this hour, especially in Don’s story, as he ponders the nature of nostalgia for his pitch to Kodak, and starts thinking about the family he has forcibly ignored. It is here that he learns his younger brother Adam hung himself, months ago when Don sent him away – another instance of a phantom rising to the surface. In the Kodak pitch and the heart-wrenching final scene that follows, Don again tries grasping hold of these things he once had, and has, as a consequence of his actions, already lost. In the pitch, he turns his family into an image, as slides in a projector – an advertisement. A thing he can look at but never truly hold. And when he rushes home that evening to find them, to join them for their Thanksgiving trip and mend what he has broken, they too have become phantoms. Weiner’s direction is again key, for Don’s fantasy of seeing and embracing his family, in the way he never has, is played utterly straight, without even a hint that it might be a dream. When we abruptly cut back, and Don comes home for real only to realize he’s all alone, my heart always, no matter how many times I see it, skips a beat. The moment is so poignant, painful, and powerful that all Weiner needs for the final shot is Don sitting alone on the staircase, in sorrowful contemplation, accompanied by the sounds of “Don’t Think Twice, It’s All Right” (which happens to be one of my very favorite Bob Dylan songs). At this point, I am, like Harry Crane at the end of the Kodak meeting, an emotional wreck. Mad Men did countless wonderful things over its eight incredible years, giving us more standout episodes and memorable moments than any other television series I can name. Ranking them, as I have done, seems at times like a fool’s errand. And yet I think about that final sequence of “The Wheel,” and how elegantly Weiner brings the emotional hammer down, and it feels right to call this the best episode this all-time great television series created. Few pieces of television or cinema resonate more powerfully than this. Come back tomorrow for one final retrospective piece in celebration of Mad Men. Thank You for a very insightful view to Mad Men, I knew that more was said in each episode than was written, I just didn't know what it was. It was about life, yours mine our friends. Some of my favorite episode were with Matthew Weiner's commentaries, dragging actors, directors, and writer's to comment on more than they were party to. Ever watch "The Orange Couch" a video summery of MM. However that my wife and I watched this show together was some thing of a phenomena 33 year anniversary this July. I a'm in total agreement with your list, and have shard some of your commentary on AMC, talking Mad Men. What a sorruful life it will be with out the best show ever. Game of thrones is filling in. Breaking Bad ( best finally, song), Walking Dead .Good luck in your future Endeavors.